Despite all the talk about “jointness” among the armed services, an Air Force investigation into a fatal CV-22 tilt-rotor crash allows as how a translation error from Marine Corps documents meant the flight recorder was not recovered. The pilot, flight engineer, an Army Ranger, and a civilian contract employee were killed in the crash. The remainder of the 20 onboard were injured but survived. The price of a rushed approach. 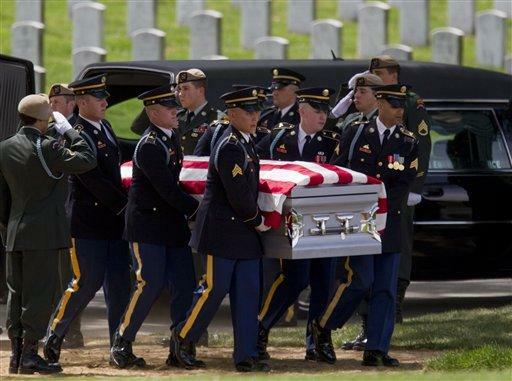 U.S. Army pallbearers at Arlington Cemetery carry the casket of Cpl. Michael Jankiewicz, who was killed in a CV-22 crash. The president of the accident investigation board said the cause of the crash could not be definitively determined. Had the flight recorder been recovered, the controversy might have been considerably tamped down. The CV-22 tilt-rotor is the Air Force variant of the Marines’ MV-22 Osprey. The Marines hope to acquire hundreds of the machine as a replacement for the venerable CH-46 helicopter; the Marines have deployed a squadron of MV-22s to Afghanistan. The Air Force version was procured to conduct long range infiltration and resupply operations, as well as to rescue downed pilots. The Air Force CV-22 crashed in April 2010 in Qalat, Afghanistan, killing four aboard; 16 survived. The precise cause of the accident remains a mystery because, according to the report of investigation, Air Force Special Operations Command (AFSOC) crews were not aware that the CV-22 was equipped with a flight data recorder (FDR). The head of the Air Force investigation, BGen. Donald Harvel, said AFSOC crews were never told that a flight recorder was installed in all CV-22s. The instruction manuals for the CV-22 were inherited from the Marine Corps MV-22 program. The manuals employed Marine jargon that had to be “translated” to Air Force terminology, but the translators made mistakes, Harvel said. One wonders. The flight recorder features a dedicated circuit breaker; apparently the crews were not aware of that either. Nor, apparently, were they familiar with the recorder operational test protocol, usually conducted before the first flight of every day. The CV-22 crashed attempting to land in a wadi at roughly 5,000 feet above sea level. Despite three trips to the crash site by rescue and salvage crews, the recorder was never recovered. Its absence fueled a rare public clash between accident investigators and AFSOC over opposing theories (the investigation was conducted within the AFSOC chain of command, compromising the necessity of an independent inquiry). After recovering the bodies and survivors, as well as sensitive equipment, from the crash site, the remains of the CV-22 were destroyed by explosives. 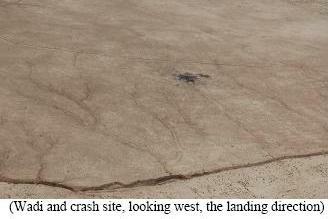 However, the flight recorder is hardened to survive a crash impact, so it is possible that the device was retrievable. A day after the crash, a team arrived to recover some items. This team also photographed items that would be recovered the next day. Among the items photographed was an object that resembles the casing containing the FDR. This item, and several others, were missing when a recovery team arrived the next day. BGen. Harvel believes that the engines suffered rapidly degraded power – possibly due to compressor stall caused by a 17 knot quartering tailwind in the critical last moments of the flight. According to Harvel’s theory, the CV-22 pilot clearly understood his situation and attempted to increase power in the last 2 seconds of flight – too late to avert disaster. AFSOC dismisses Harvel’s theory as unsupported by a “preponderance of credible evidence.” The command’s internal – and unreleased – report supposedly attributes the crash solely to pilot error. The pilot and flight engineer died in the crash. The co-pilot survived but supposedly suffered amnesia. Now we have a missing FDR that could have provided key insights into the flight’s last moments. The aircraft is particularly prone to what is known as “vortex ring state” when descending to land at a high rate of descent. The Marana airplane, hovering slowly in helicopter mode and not really “wing-borne”, totally lost prop-rotor lift on one side, an asymmetrical condition that instantly flipped the aircraft upside down. Vortex ring state for single/tandem rotor helicopters is a well-known cause of “arrival” accidents (leading to skid damage or worse). The Osprey was a configuration for more a much more dangerous variant of vortex ring state. To avoid the condition, the Marines enforced strict approach envelope limits (speed versus rate of descent) for landing or hover, and for approaches invariably to be “into the wind” (where there was a choice, i.e. obstacles not limiting). 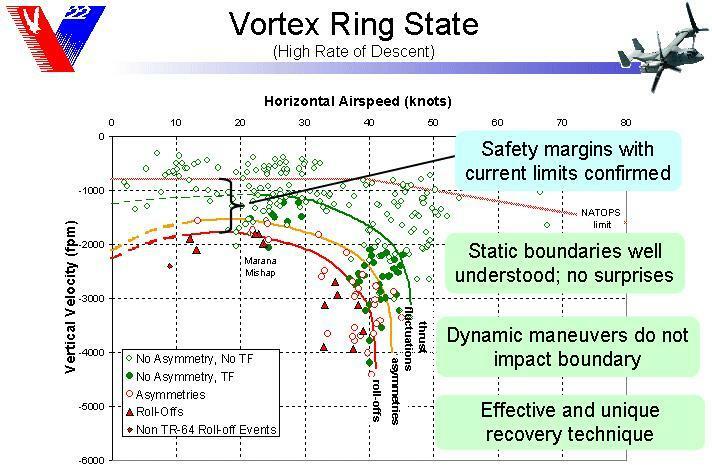 The Afghanistan crash shows no evidence of rotor-induced asymmetric rolling arrival at terra firma, but the high descent rate just prior to its high forward speed ground contact would seem to indicate that a “hybrid” symmetric vortex ring flight condition is also possible. How so? Ground contact was made with a significant forward speed indicating that partial mainplane lift was still in play. However, the quartering 17 knot tailwind could still have tended to allow the airplane to settle into its own downwash (a nice set-up for vortex ring induction – think of the “arcing over” nature of any approach with a significant tailwind component). This was a deadly lesson learned earlier by the Marines and doubtless passed on to the Air Force. However the insouciance of accepting a tailwind approach would seem to indicate that Air Force CV-22 crews had de-prioritized the hazard and had not accepted that they were equally vulnerable, despite that aerodynamics doesn’t wear a uniform. In the Marana crash investigation, Majors Brow and Gruber were criticized for their inexperience. The surviving CV-22 copilot of the April 2010 crash has 2,600 hours experience, and the pilot flying was similarly experienced. Pinning the Afghanistan crash on pilot naiveté was more problematic, especially since one of the pilots survived the crash. His amnesia cited by Harvel’s investigation seems conveniently selective. Instead of saying, “I don’t remember anything,” the copilot seems to recall the flight in detail, describing the approach right up to 0.4 miles from the landing zone, where his amnesia ostensibly starts. — Running late (time pressure). — A way-too-high rate of descent (raising the specter of a hybrid/incipient vortex ring state). — Task saturation in the cockpit. 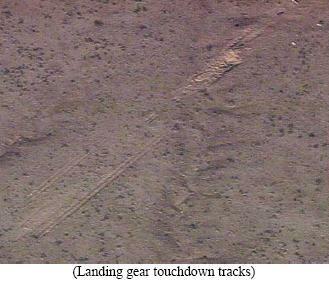 The similarities to the Marana crash are striking. Harvel made specific note of the time pressure and theorized that it was the reason for a non-standard, improvised approach. Apparently, to make up time the pilot flying performed a high-speed descent and violated the “standard” profile established for such approaches. In fact, at every point in the approach, he was nearly double the prescribed airspeed. Complicating this was a 17 knot tailwind, and the failure to swing around and land the CV-22 into the wind. The pilot flying made up the 5-minutes he was late and thus managed to pretty much meet the time-on-target. However, he did it only by flying what could be called a non-standard approach. 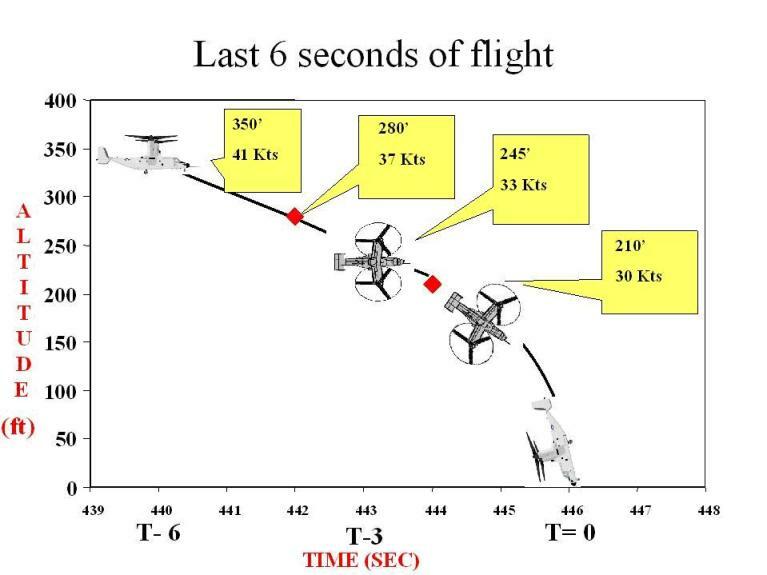 During the last few seconds of flight, the CV-22 entered a very high rate of descent. Concurrently, there was reportedly some unspecified “excited cockpit conversation.” BGen. Harvel presumes that it was between the pilot in command and the flight engineer and was with reference to going around. Just about at that point, the main landing gear tires struck the ground. The accident report is vague on whether this was intentional or unintentional. In either case, the touchdown was downwind at a groundspeed of about 80 knots. The accident report “assumes” that (1) full power was already applied, and (2) there was insufficient power to carry out a go-around. BGen. Harvel speculates that both engines suffered an unexplained and simultaneous power loss. It’s too facile an argument. 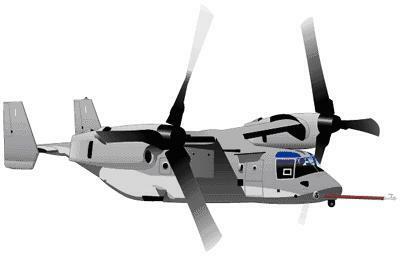 The V-22 has a very heavy duty interconnect driveshaft and gearbox that allows either engine to drive both prop-rotors in the event of an engine failure on one side. There could be another explanation for the high forward speed arrival if the pilot was fighting an incipient tendency to roll (Marana style) upon commencing his translation to rotor-borne flight. Experience (and control feedback perhaps) told him that to further slow his forward speed and enter heliborne flight would lead to an instantaneous and probably fatal snap-roll. Maintaining speed for a wings-level touchdown was the only option if a hybrid symmetrical vortex ring condition was evident once below wingborne stall speeds (prop-rotor nacelles tilting progressively towards the vertical). 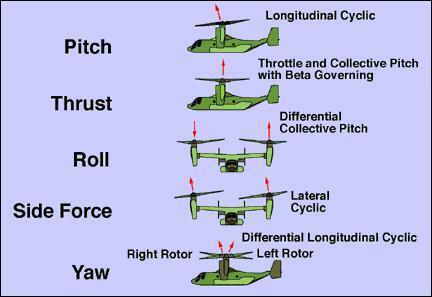 It’s quintessential for understanding here to observe that the control configuration for roll necessarily (and gradually) changes as the tilt-rotor transitions from wing-borne to prop-rotor borne flight (and vice versa). Reviewing the Marana incident, as the pilot sensed the right wing begin to drop in rotor-borne flight, he would naturally have opposed it with an immediate “opposite aileron” input. However, in the V22 what he’s actually doing is increasing pitch and power to that engine on the dropping wing (i.e. roll control in V22 helicopter mode is now a function of “differential collective” – between port and starboard engines). But as helicopter pilots know, to exit a vortex ring state they must reduce collective pitch (i.e. reduce power and blade angle), lower the nose (cyclic stick input) and accelerate forward and out of the vortex. What the Marana pilot did, in his ignorance, was to solidly embed the right hand prop-rotor in the vortex ring condition, inducing an accelerated snap-roll. One suspects that Bell/Boeing designers had not fully appreciated this possibility. Recall also that the V-22’s rotors are unlike helicopter blades. They are a limited span compromise “prop”-rotor with a highly concentrated disk-core and very limited “flappability.” They are also capable of slightly negative nacelle angles (i.e. beyond 90 degrees). Good for quick slowdown, but increases the peril for vortex ring onset. Relevance to the Qalat crash? It’s likely that during early transition, an incipient roll tendency became evident to the CV-22 pilot and he instinctively knew that to slow further (i.e. continue his slow-down transition) would inevitably lead to a snap-roll. Like any vortex ring-trapped helicopter-pilot, he froze the power, kicked the nacelle angles forward and lowered the nose to maintain speed in an attempt to accelerate and fly out of the vortex ring state. Unfortunately, these actions increased his descent rate greatly and so his lack of altitude (and terra firma) intervened. But at least he had the right idea, soaked up the impact with the gear and saved some lives. Fixed wing pilots might better identify with the pilot’s conundrum if they think of the challenge of wing-drop during an approach to a stall. Attempting to pick up the dropping wing with aileron can quickly induce autorotation (i.e. flick the airplane into a spin). Fixed wing pilots are taught a non-instinctive recovery response utilizing rudder. V-22 pilots can kick the slow travelling nacelles forward and trade height for speed while gingerly introducing power. So, to encapsulate the above theory, the pilot flying was late and under pressure, he flew a non-standard approach and crashed. Why? He’d started (albeit late and rushed) the CV-22 slow-down into hover transition but then, necessarily, had to opt for a horrendous rate-of-descent to escape a tailwind induced vortex ring state. In the V-22, when things go wrong, they go wrong fast. To be sure, the pilot flying almost pulled it off. The rate of descent (as high as 1,800 fpm) was just about to be arrested when the main landing gear touched. But the CV-22 was still moving with a horizontal airspeed component of 80 knots, plus the tailwind. The nose plowed into a small drainage ditch and the CV-22 flipped over. The dynamics and the aerodynamics of the accident are probably well known to Marine/Air Force program insiders and Boeing/Bell. However there’s a long tradition of cover-up of unpalatable facts in this lengthy and contentious acquisition program. Unfortunately, there are too many unanswered questions for the convenient overall explication to “wash” well. The commander of the “battle space” quickly called for the CV-22 to be destroyed – a decision that caused BGen. Harvel no small amount of anxiety given that it was a fatal accident. Whatever could have been gleaned from the wreckage was forever lost. Why not send a CH-53 heavy-lift helicopter to bring the wreckage pieces back for inspection? Why wasn’t the recorder later located in the bombed wreckage? And the bit about not being aware of the FDR – because of a translation problem in the manual – just begs the question: what language were the Marine Corps and Air Force speaking? English, a common tongue, not Pashtun and French. The smell of cover-up is dank. Back to the V-22 specifically. Skeptics have always said the airplane must be handled carefully, especially in landing. The V-22, as evidenced by a history of crashes and incidents, is touchy – perhaps unforgiving in the hands of an inexperienced, rushed or pressurized pilot. The April crash near Qalat, Afghanistan, shows what can happen when an experienced V-22 pilot tries to hurry his approach. Evident consternation in the cockpit probably didn’t help resolve the impending “no exit” flight condition. One suspects this won’t be the last accident of this type. 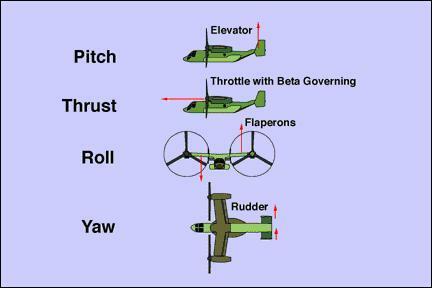 The tilt-rotor is an unforgiving beast and must be carefully flown on approach to stay within a constrained flight envelope. It may be convenient to blame accidents on “engine problems” or “pilot error,” or misunderstandings to “translation” issues between Marine and Air Force flight manuals. But the long and troubled history of the V-22 tilt-rotor suggests another conclusion: this vehicle is not suitable for combat operations. The hallmark of a superior combat flying machine is its forgiving nature under non-standard conditions — and its maneuverability, particularly when escape relates to survival.